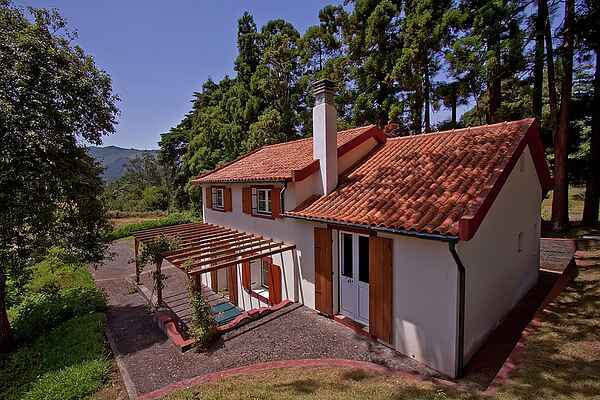 This fun cottage offers a unique holiday experience on the beautiful island Madeira. There is much to explore and enjoy on the property and it's only a few minutes from the sea. The house is surrounded by mountains and offers a quiet and peaceful refuge for a family or group of friends looking for a special accommodation on the island. The house (PT-9100-01) is suitable for eight people, the smaller cottage (PT-9100-02) is suitable for six people. The properties can be rented both together or separately. This peacefully located house has a swimming pool and a large garden with a view over the mountains. Explore the terrain and enjoy the local flora and fauna. Also try to play the large game of cricket on the lawn! The Santo da Serra golf course, with 27 holes and part of the PGA European Tour, lies only a few minutes away. Palheiro Golf is only 20 minutes away. There is also a horse riding school and the village has a beautiful park with mini golf. Quinta das Colmeias can organise for you various activities from Golf to guided walking and Whale and Dolphin Watching and even the possibility to swim with dolphins. Santo da Serra has a fantastic market every Sunday where fresh local agricultural products, bread and cakes are on sale as well as a variety of other products. A variety of restaurants cater for all clients, including the fantastic scones at Serra Golf.